I have previously been a Glossybox subscriber but I did cancel my subscription when money got a little too tight to keep it up. I also found the boxes quite hit and miss, but this is the nature of surprise subscription boxes, you can't please everybody all of the time. What I do now is I keep an eye out for posts popping up showing the contents of that months Glossybox, Birchbox etc and if I like the contents then I'll order the box as a one off and cancel my subscription before I'm charged for the next one. 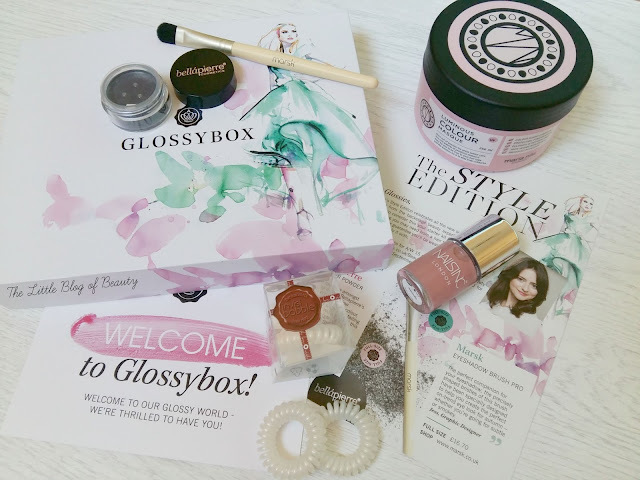 Earlier this month Glossybox tweeted one of the products that would be included in the September box and I instantly knew that I'd need to order it! The product that sold this box to me was the Maria Nila Luminous colour hair masque. As the mask is full size (worth £18.95) and I was planning to buy it anyway it made perfect sense to pay £13.25 for the Glossybox and get four other items thrown in as well. The masque is sulphate and paraben free and full of nourishing, strengthening and protecting ingredients that enhance coloured or natural hair. Although I haven't tried this yet I have had a little nosey in the pot and I was surprised by just how thick this is, as you can probably see by the picture. I've just dyed my hair for the third time in as many weeks (don't ask!) but I'm finally happy with it and am looking forward to slapping this on my hair for a little treat. When I ordered the box I only knew about the Maria Nila mask and had no idea what the other products would be. I was really pleased to hear later that all products are full sized this month (how amazing is that!) and when I saw posts popping up with the contents I was both excited and a little nervous about a couple of the products. The first product I had mixed feelings about was the Nails Inc nail varnish (worth £11) which will come in either a khaki or blush pink shade. I really didn't want the khaki shade as it just doesn't appeal to me at all so I was delighted when I opened my box to find the pink shade, which is called Uptown. I'm a big fan of Nails Inc so this gets a big thumbs up from me. The second item of mixed feelings was the Invisibobble (worth £4). I've wanted to give these a try for a while but I believe the original ones were only available in bright colours and I wanted something more subtle. They have since released more colours and again I was relieved to see I'd received them in a cream/white shade. The colour still isn't ideal for me as I currently have dark red hair, but if I like them I have my eye on a burgundy type colour that I might pick up later. The final two items go together nicely. These are a Marsk makeup brush (worth £16.70) and Bellápierre Shimmer powder (worth £12.99). I'm certainly no expert on makeup brushes, especially eye brushes, but this feels nice and soft and for an eye brush is quite large, so this might good for getting a lot of colour onto the eye lid. I haven't tried a Bellápierre product before, or a loose eye shadow, and although it's quite a dark shade and out of my comfort zone I'm determined to have a little play with this to see what it's like. Of course I haven't actually touched on the box itself yet. This months box features a beautiful watercolour painting design on the top of what looks like a model walking down a catwalk. In general I think this is one of the best Glossyboxes I've ever seen, from the pretty box, mint green shredded paper and bright pink ribbon to the lovely products included. As I've already mentioned everything in this box is full sized and the contents are worth £63.64. There's also a discount code included to get 20% off Maria Nila products from the Sallys Express website, valid until 31/10. 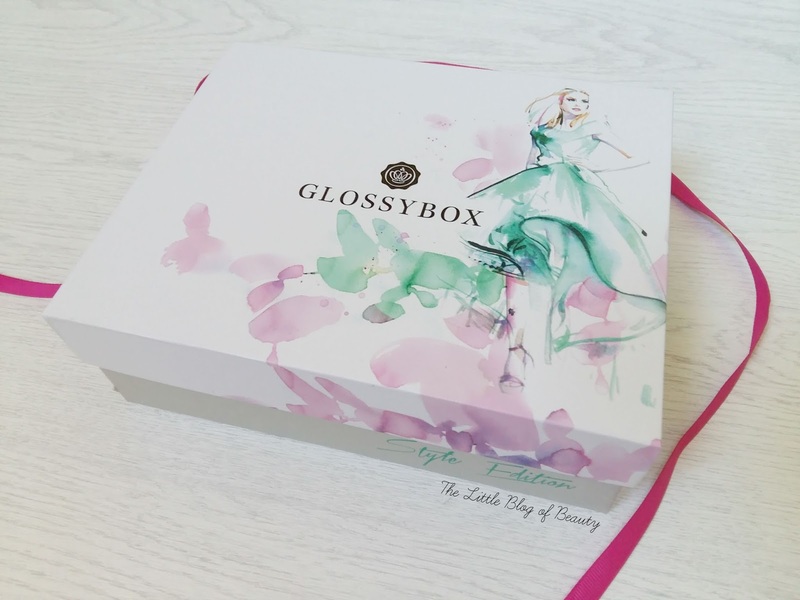 If you've been thinking about trying Glossybox I'd definitely recommend grabbing this months box before it's too late. You can subscribe to Glossybox here. What is your favourite product in this months box?